Here I am, back to my blog, to ramble on about the materials I will use on Pedion tiles. I know, I know; the last blog post was not too impressive, lots of talk, and no "real" terrain progress showing. But it was an important part of developing Pedion, and I feel I should share it with anyone interested. However, I WILL try to by "less text wall, more to the point" in this third blog post, to make it an easier read. So, as finalized in my previous (#2) post, I decided to go with Square tiles, each measuring 30x30x1(thickness) cm. The next step was to decide a) which materials to use and b) how to keep the modules connected to each other - both points I will be tackling here. Before describing my process, let me remind -once more- my Requirements which apply to the Tiles, as presented in post #1: Modularity, Efficient Storage, Lightweight, Economical, Durable, Appearance, Level surfaced, Seamless and Connectivity - all these under the perspective of mass producing Pedion, not just making a home-brewed terrain table. Most of these Requirement play a major part in selecting construction materials. Efficient Storage is quite covered by the selected tile size and depth. Seamless and Connectivity we will cover further below. All the others are crucial, especially the difficult combination of Lightweight/Durability/Economy! Also, regarding Appearance: I wanted the Pedion tiles to be made from something to allow me to work with and create depressions on the terrain. That meant that a simple, hard basing material was not enough, but a more malleable material (like foam) was needed. My first effort, as shown in the pictures, was the use of Foam Board, also known as Foam Core, the material most Architects use for modeling (told you I'm an engineer, didn't I?). For those of you who have not heard of it, it's a combination of solid foam sandwiched between two layers of strong cardboard (we call it "maquette paper" in Greece). I used 1 cm thick foamboard (about 0.4 of an inch) and cut it into my 30x30cm (~1x1ft) squares. 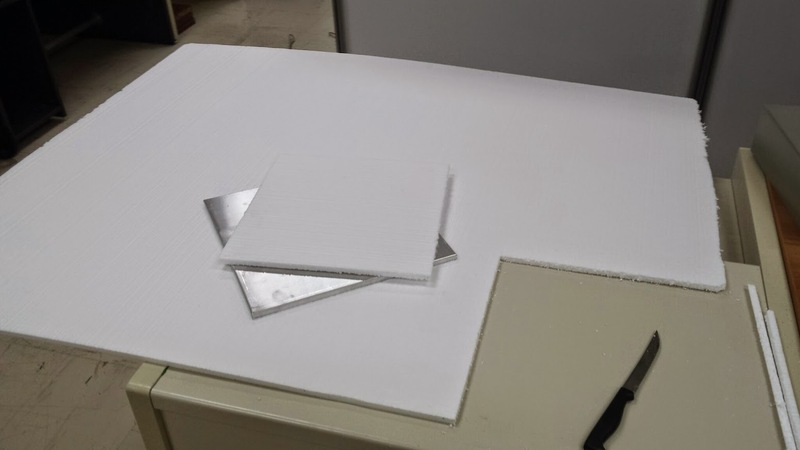 Foamboard has a variety of great advantages: it is strong, yet extremely lightweight. It can be cut by normal craft tools, like a hobby knife, although it requires a proper method to do so (watch Mel's great video tutorial). And it combines the rigid cardboard with the foam in its core, so I could just "dig" into the stuff and create anything I wanted (up to 1 cm deep), and still have a base underneath. It also allowed me to keep a small (2-3 mm) cardboard "edge" on each tile, so they could overlap and cover the seams a bit. 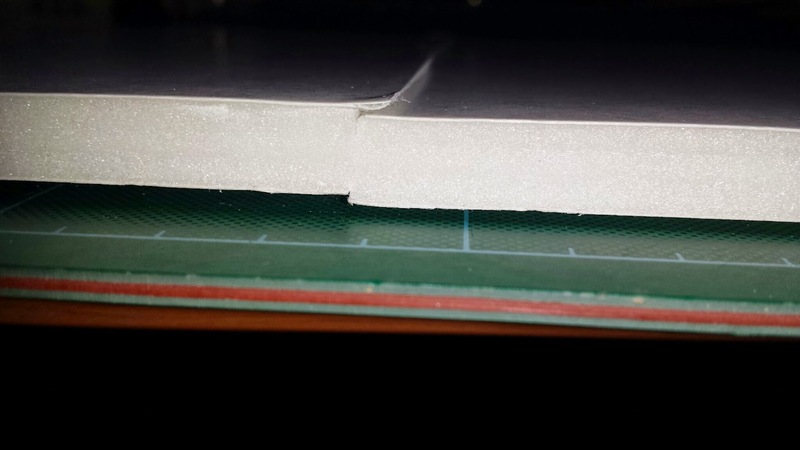 Finally, while not as cheap as pure foam sheets, it is not to expensive either (even at the 1 cm thickness) so I could keep the project cost low. So, why I keep using the past tense? 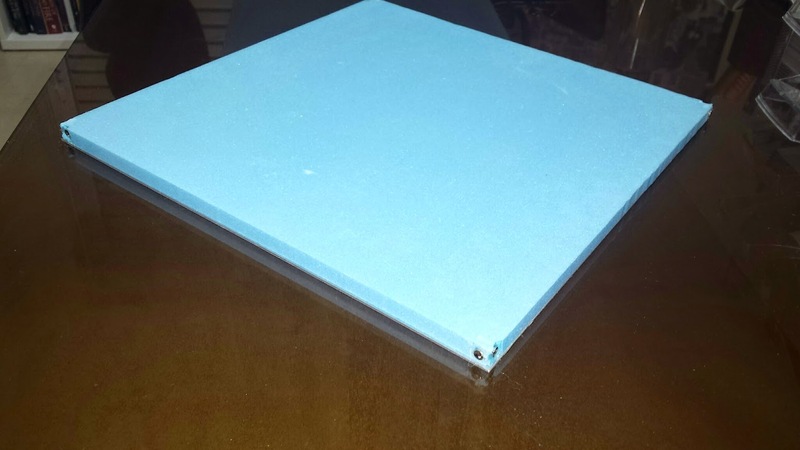 What went wrong with foamboard? Well... it wraps, as many people using it will tell you! To be more precise: it does not always wrap, and you can minimize/avoid warping with proper preparation. You see, what happens is this: when you apply to much liquid on one side, say watered-down PVA glue (as it is bound to happen in terrain making), the water shrinks the cardboard on this side. The shrinked cardboard then pulls the foam core and the other side, and the sides and corners of the tile are raised. How to avoid this effect? you can put duct tape on the under-side, even "paint" it with watered-down PVA as well, to refute the warping effect when the upper-side will start shrinking. However, this is something you can try for a homemade terrain, not as standing method in consistent-quality mass production. Oh, and there were also Durability issues: much use would start to fray the edges of the cardboard. 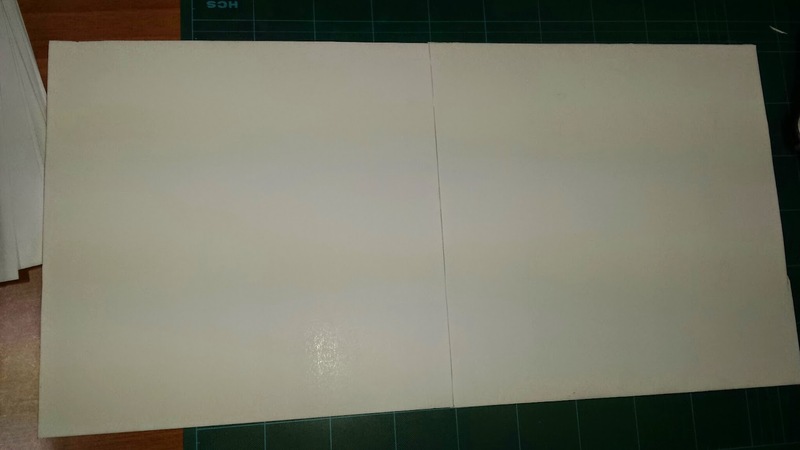 All in all, I had to abandon foamboard for my tiles, although I will be using it for smaller terrain pieces - and I still find it a good solution for something a home user could make. I moved on to my final (so far) solution: the combination of solid foam sheets with a basing material underneath. I wanted the foam part, since it will allow me to sculpt it into depressions, rivers etc. So I will be using polystyrene foam sheets, 1 cm thick, cut into 30x30 cm pieces. I tried both kinds of polystyrene foam available in the mass market, the expanded foam (called felizol in Greece) and the extruded foam (XPS, also known as DOW or styrofoam). 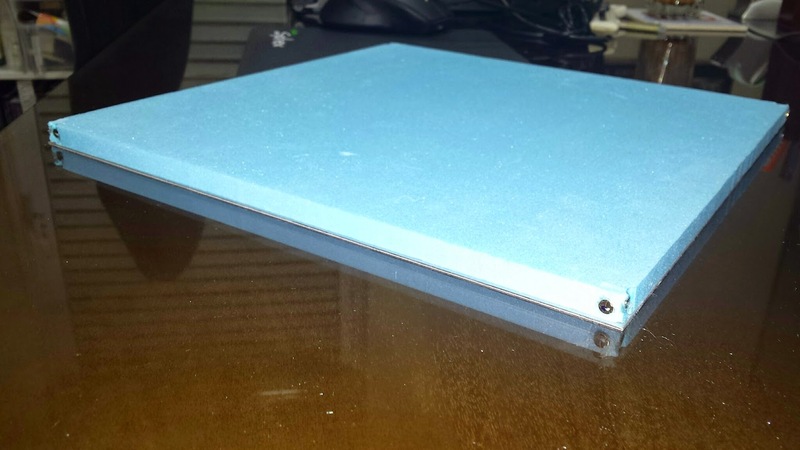 Both have pros and cons, with the extruded sheets obviously more durable and rigid, but more expensive. Cutting them in shape is a wife's nightmare, but for mass production I would have to use a professional solution, involving heated blades or wire cutters. I will probably use both in Pedion, with expanded foam the most likely candidate due to cost (and it will be protected from its basing material anyway). Both solutions are extremely lightweight and quite economical. As mentioned above, the foam tiles will be attached on some sort of base. Why the base? First, from experts on the field, I have heard than even XPS, can wrap a little, or fray, however rigid and durable it may seem. A 2 mm rise on the corners could well spell disaster for my modular tiles - so better safe than sorry. Secondly, as I mentioned, I want to dig into the 1 cm thick foam, and still have a solid surface underneath, to act as, eg, the river bed. Thirdly, the base can be shaped to help with connectivity options. 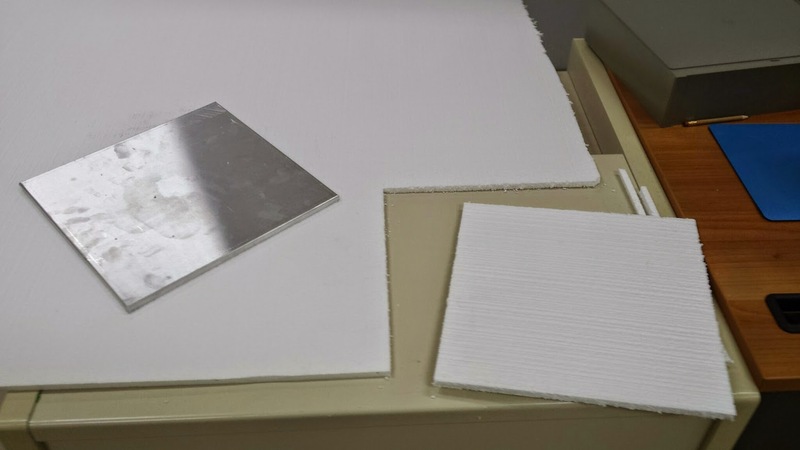 Many materials could be used for a hard base under the foam sheet. Of those, I did not choose the most obvious and popular solution: wood, in the form of MDF. MDF sheets are a) too heavy b) too pricey, and c) still difficult too cut, compared with my other solutions. Do not get me wrong - MDF would have been my choice if I made Pedion just for myself . But in terms of mass production other materials are available: die-cut metal and plastic PVC sheets. So far my tiles are produced with a basing of a thin sheet of aluminum (I tried steel - durable but heavy, you have no idea how heavy...). I chose aluminum 'cause it is a) Durable, b) Rigid, c) Light, d) Thin - I have used 1 mm (0.04") thick sheets, but will probably go for even thinner, at 0.5 mm (0.02"), d) Cheap, at these lightweight thicknesses. Obviously you do not cut it at home, but I have secured access to industrial die-cutters. Right now I'm experimenting on plastic (PVC foam) sheets - they seem equally lightweight and durable, not to mention low-cost. Both solutions seem valid, and my final selection will come after some extensive cost-analysis. Still reading? great - let me talk a bit about another requirement I have had. This is something that many manufacturers of modular terrain do not necessary tackle: keeping the tiles connected to each other. It is an issue for me and my Pedion tiles; you see, in many modular solutions the tiles are just too heavy to easily move around, or the manufacturer simply does not think this is an issue. However, Pedion tiles are lightweight to better carry them. And I wanted my tiles to keep together, even if somebody accidentally pushes one of them. On the same time I did not want a connectivity solution that would sacrifice Modularity and the ability to easily interchange and rotate terrain pieces on the table. The first solution I came up with was to drill small wholes on specific distances from each tile corner. Each hole would be by the middle (thick wise) of the foam sheet, and there would be 8 holes total. Then each tile would slide to connect to the surrounding ones be using small, round pins - in my prototype I used common round toothpicks and they worked remarkably well. They maintain a strong grip among the tiles - so strong in fact, that you could lift 6 (2x3) interconnected tiles and they would keep together. One did not even have to join all the tiles, as you could just connect the framing tiles of your gaming area and they would keep the rest in place. See the toothpick pins between the tiles? 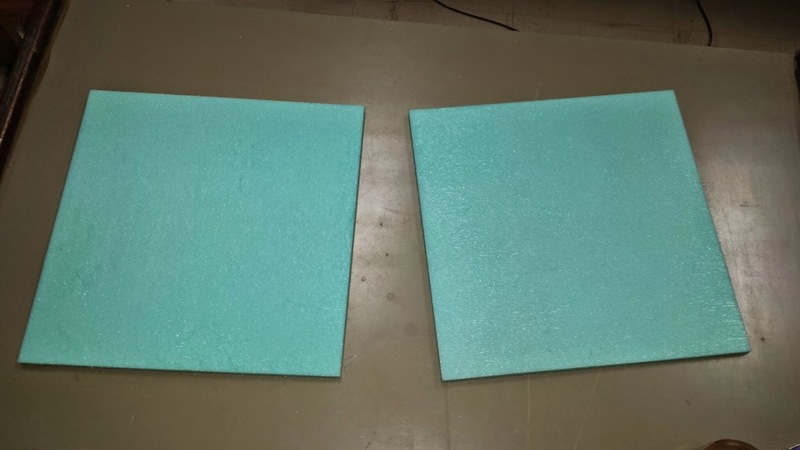 It was (and is) a good, solid solution, and I would recommend it to anyone thinking about connecting foam tiles he/she has at home (post a comment below or join me in google+ if you need to know the details). However, the toothpick pins pose some minor disadvantages. It is not an easy solution to implement in mass production quantities of tiles. Also, it requires some extra effort when placing the tiles, in order to slide them carefully together, in a particular order, so that the pins enter correctly (not to mention some pricked fingertips). Then, the foam hole starts to get wider after a while, as the pins enter and exit repeatedly, enlarging it in the process. 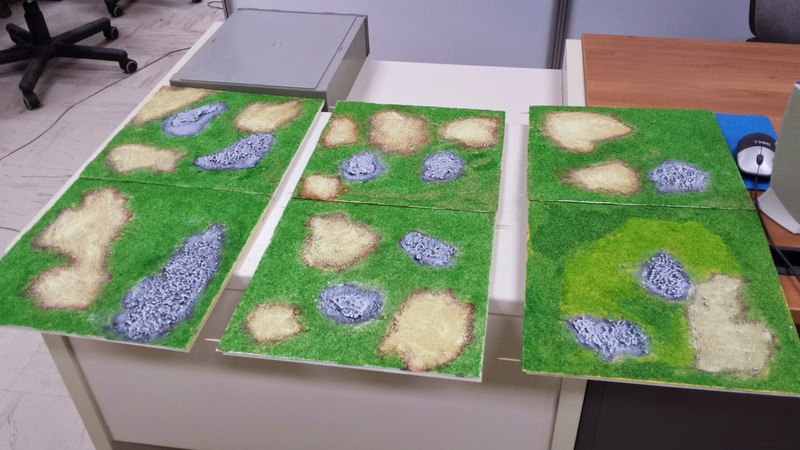 And finally, I had a small gameplay issue: when the tiles are fixed together, it is not easy to un-pin them and reconnect them, something that some games (like the Field of Glory Napoleonic ruleset) require for their terrain pieces (eg in FoG one player places and the other can rotate or move). All minor points, but I wanted something better for Pedion. So I designed my current solution: magnet connectivity. Instead of small holes, strong magnets are mounted on each tile corner, eight magnets total. Their polarity is aligned so that they can easily snap together. This solution works like a charm: the tiles snap and unsnap to each other without effort, and the tiles are truly interchangeable but still keep solidly connected. By the way, this is not exactly an economical solution - magnets are cheap, but this is a LOT of magnets. If thing go well for Pedion, and we enter actual mass production, I have even better connectivity solutions in mind. But these require die-cutting of the base in a specific and complex way, that requires expensive matrices. Therefore, I will stick with my magnets for now. If I managed to interest you so far, thank you. Trust me; the boring posts are over, and the next ones will more about the terrain itself. I NEED your comments and ideas, to improve Pedion even more, so do not be shy. And stay tuned!